Online Orders Now provides exceptional software for restaurants. We offer a robust and sophisticated online ordering system that fully integrates with most any POS system, a simple and intuitive ordering interface, a host of exclusive features with practical benefit, and a $20,000 Additional Revenue Guarantee to boot! But, just for a moment, let’s dream together. Let’s suppose you had NOW’s online ordering software for restaurants, and it helped you establish a new revenue stream — something that gives you a bigger financial cushion and the chance to invest into other parts of your restaurant, not to mention the fact that it allows you to take another week of vacation this year (something we shouldn’t be ignoring!). Okay, that idea isn’t so hard to imagine becoming a reality. Let’s take it a step further now. Let’s imagine you had the ability to serve some of the best food in the world. People would come from far and wide to sit at your tables, paying thousands of dollars just to try a few delicious bites of your impressive menu dishes. Things go so well, money becomes no object, you become famous, and you get your own Netflix TV special that seeks to discover the latent genius in your work. Alright, that scenario might have a slightly worse chance of coming to fruition than the first hypothetical we posed. But wait, that latter hypothetical isn’t yet over. In fact, we’d like to amend it insofar as you never got your Netflix special. You never got your Michelin Star. Why? You couldn’t keep your staff happy, despite your natural ability to work with world-class chefs and source top ingredients from around the world…your servers and backroom staff found you deplorable, so you never were able to get out of first gear. Now, that introduction might be a touch histrionic, but the point remains solid, in our humble opinion: Whether you are the owner of a humble sandwich shop that is just starting to make some inroads or you are a premier restauranter, if you and your managers aren’t able to positively relate to your staff, you are going nowhere in the long run. 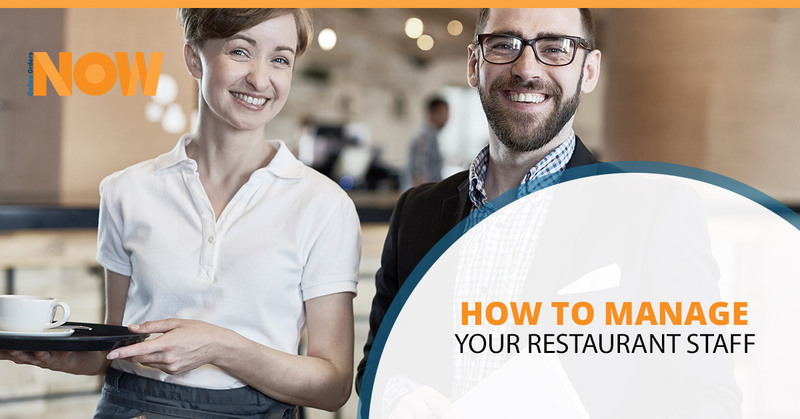 Today’s post aims at providing restaurant owners and managers with some effective and practical tips for managing a restaurant staff. Let’s dive in! Let’s start with one that you can apply to any facet of your life, not just the restaurant side of things. Being positive has an amazing impact on those around along with yourself. Heck, even forcing yourself to smile helps you feel better! The trite adage, “Fake it ‘till you make it” happens to ring true here. More specific to managing a restaurant, however, is that you need to understand how your mood rubs off on other people. Many folks in positions of authority don’t realize that their attitude, be it positive or negative, impacts the way others feel and act. Over time, it can make or break your work environment. You might wake up one day and wonder how your entire staff got to be so cranky. You don’t want to have a sobering look in the mirror to find out the answer. Instead, how about you be more intentional about how you respond to your staff and other things. What other things? Namely, when things don’t go well, do your best to be mature. If you behave immaturely, that gives your staff the license to act the same way in turn. Set the right kind of precedents. If you want respect, you’ll need to be transparent with your staff. While this fact might not seem like a revolutionary one, it’s implementation becomes more difficult than the idea itself. Millennials, in particular, need to know what’s going on in order to perform well. If they are left out in the cold, so to speak, they won’t be motivated to work hard, for one, and for another they might feel insecure about not being communicated with. What sort of things are we talking about, specifically? It really depends, but having consistent check-ins with your staff is a good place to start. Having monthly or semi-monthly staff meetings is an excellent idea, if for no other reason than helping everyone be on the same page. If appropriate, you can open up the floor for feedback, both positive and negative. If you are able to foster a healthy working environment (and haven’t hired complete troublemakers), things should go decently well. We’d also recommend you check in with your employees in one-on-one settings. It doesn’t have to be anything formal. Just show them that they are valued team members! And while we are talking about staff meetings, don’t be afraid to have a little fun! Get to know your staff, take them out and splurge on them with an activity and some beverages. It’s an investment. Despite what a different trite adage might say, the customer is indeed NOT always right. Though customer service should be among your chief priorities as a restaurant manager, words like “always” should rarely be used. Instead, “it depends” is more close to the truth, though it doesn’t really help with specifics. Luckily, you have your trusty brain to help guide you through difficult situations. Use your considerable experience (even if it’s not restaurant experience in particular) to determine what you need to do when a customer and staff member are at odds. When in doubt, have your employee’s back. There will be times when your staff has to deal with uppity, arrogant, rude, unpleasant, entitled, and maybe even evil customers. Plus, they have to do that a lot more often than you do, in all likelihood. Even if your server or host/hostess made a mistake, we’d recommend erring on the side of giving them the benefit of the doubt. No one is perfect, and we all need a chance to learn from our mistakes, or at least get an odd “mulligan” if we are having a bad day! Your staff and customers have something in common. If you set them up for success, things will go well for you. For customers, that can look like having an online ordering system that is easy to use, remembers their custom orders, and doesn’t fail them. Online Orders Now has got that covered. For your staff, you want them to be able to use a POS system that seamlessly integrates with their online ordering system. Plus, having an online ordering system in the first place means they’ll be spending less time on the phone taking orders. That means improved efficiency, order accuracy, and bigger tips for your staff to share! We hope you’ve enjoyed this brief look into the world of restaurant managers. The final thing we’d like to say on the matter is that we understand your job is very difficult. It’s not easy juggling a million different things at once and wearing a thousand hats. So…hats off to you for looking to improve yourself, and we hope that you might some of our tips useful. Keep an eye out for part two, in which we take a look at a few things restaurant owners should definitely NOT do, with regards to staffing and beyond! So be sure to check back in so that you can make your restaurant the best possible version of itself. We would love to be instrumental in growing your business. In the meantime, you can learn more about our pricing here, or you can reach out to us today to learn about how we can help make your restaurant become more profitable! The time to add an online ordering system for your restaurant is now.